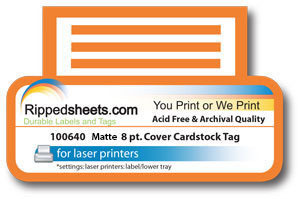 This 100640 8 pt Coated Cover Cardstock is one of the brightest, whitest Sand cardstocks available for laser printing. Its CIE whiteness is 106, and its GE brightness is 92, thereby enabling it to reproduce printed images that are vibrant and colorful. This material is commonly used for greeting cards, social and business invitations, and announcements. 100640 Cardstock is archival quality, both Elemental chlorine-free and acid-free (alkaline). This card stock is made of recycled 10% post-consumer fiber. 100640 passes US Postal Service non-automated postcard specifications.